On one hand, the kitchen backsplash is quite utilitarian, its purpose to protect the wall behind a sink or counter from the various splatters and splashes that occur during cooking. On the other hand, from a design viewpoint, the kitchen backsplash provides a wonderful opportunity for innovation and creativity. There is no set area that a backsplash should occupy. It only needs to be large enough to contain the cooking splatters. It could continue around the entire kitchen, which can add a sense of cohesiveness to smaller kitchens; or if you have a larger kitchen, a narrower kitchen backsplash can provide a dramatic focal point that draws the eye to an interesting appliance or fixture. 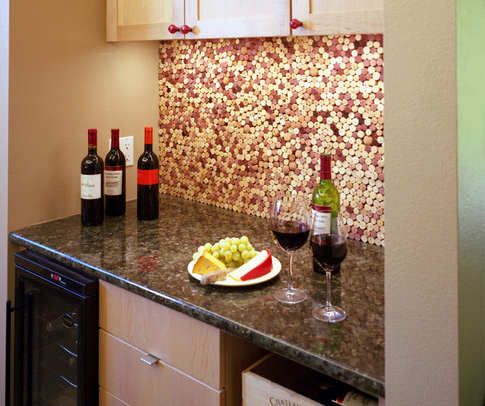 Your kitchen backsplash can can be covered in a variety of materials, ranging from more traditional ceramic tile to unique applications of stainless steel, or even wine corks! Here are five images that illustrate the diversity of options that you have when designing a kitchen backsplash. Turn your tile on end for a nice change by placing it on the diagonal. The solid dark color of this tile contrasts beautifully with the lighter natural-grained wood cabinets and the light colored unsanded grout with “tight” lines ties in perfectly with the white ceiling, especially in the area of the range and hood. This is an excellent example of tying together contemporary and traditional elements. Note, however, that turning your tile on the diagonal will require more tile to cover the same area. Also, your labor costs might be higher when going this route, as laying tile on the diagonal requires more cuts at the top and bottom. Considering how beautiful the results can be, this might be an expense you’re willing to accept. 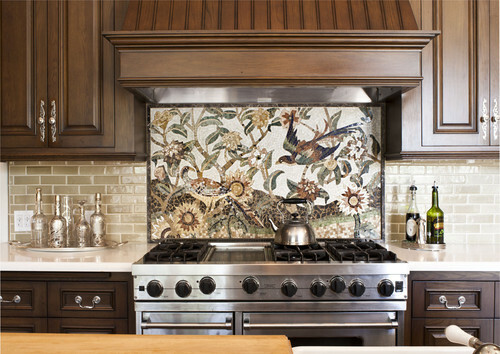 For a more dramatic impact or to focus on a focal point, a mosaic backsplash might be the way to go. If you’re creative enough and your budget allows, you can use a design of your own; otherwise, designs can be purchased from a tile manufacturer who specializes in custom tiles. 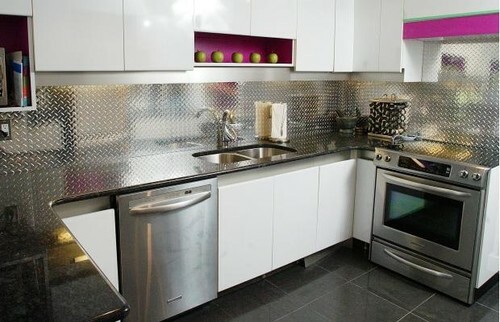 The example below shows a beautiful mosaic backsplash as a focal point combined with classic horizontal subway tiles. Beautiful. If you’re on a tight budget, your local hardware store is a great place to find interesting materials to use for your kitchen backsplash, such as this example of using diamondback textured sheet metal. This material lends a bit of a “commercial kitchen” air to your work space, a great look if you have an abundance of stainless-steel appliances; however, if you tend toward the traditional, this material might leave your kitchen feeling a bit colder than you prefer. As my readers are aware, I love to explore the creative reuse of everyday materials, particularly those that might otherwise get thrown away. That’s why I’m so enamored with this technique! 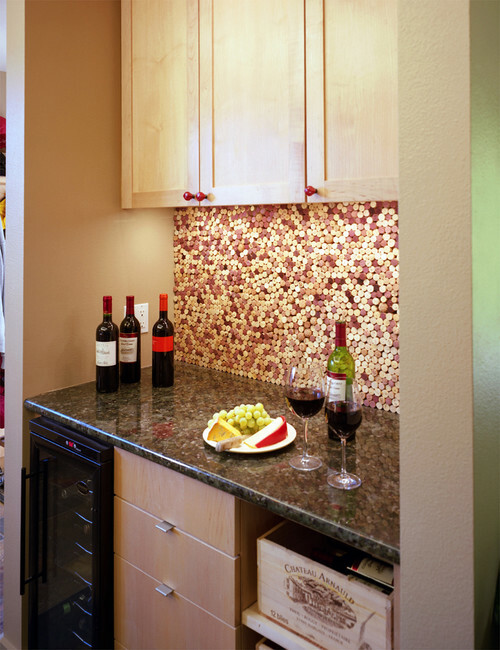 Old wine corks provide a refreshingly eclectic backsplash material for anyone who has the time to install them. I’ve been collecting wine corks for years and have a whole bucket full of them! If you aren’t a collector, you can often buy them from bars or restaurants that save them. As much as I love the wine cork backsplash idea, I saved my favorite for last: copper backsplash! I love copper. I have copper pots and pans and mixing bowls in my kitchen, even a copper colored toaster. My “silver”-ware is copper! 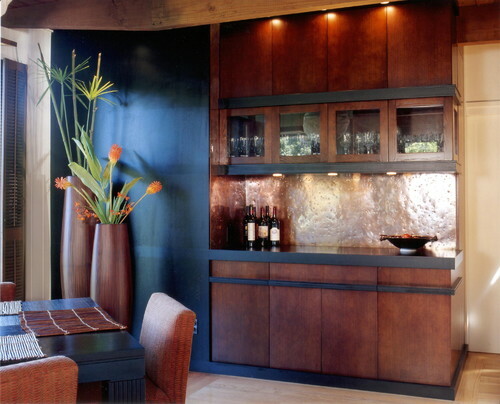 So naturally, I love this use of copper sheeting as a backsplash material. Rumor has it, the texture was created by placing the sheets of copper in the road and running over them several times. Hmmm…. 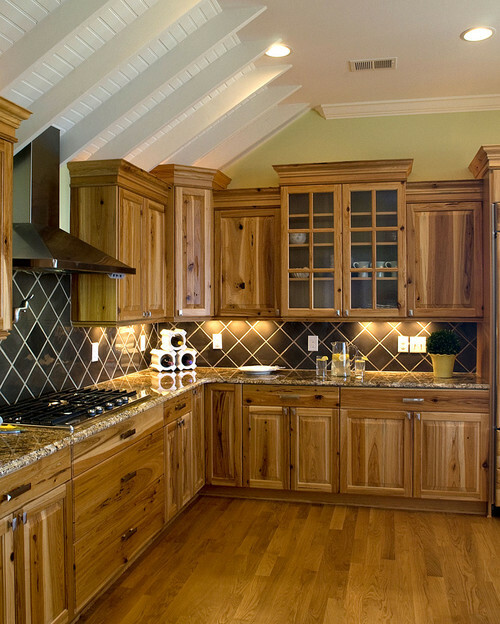 Have you recently remodeled your kitchen with an interesting backsplash material? Let us know about it in the comments!